You Know What Would Be Perfect Right Now? These Rain Boots! They're so cute, we cannot even. So. You have an oversized sweater, a cardigan, a parka, more oversized sweaters, a raincoat—basically, a wardrobe that can withstand three more typhoons. Sure, your waterproof flats can protect your feet from those tiny puddles during the morning commute, but can they really last? Lately, we've been obsessed with rainboots. And not just those plain-colored ones you can get from department stores. We're talking about cute, printed boots that aren't just pretty to look at, but insanely functional. Which is why the new Plueys rainboots are our newest favorite fashion things. Because how can you be sad about walking in the rain when your shoes are this cute? The boots have sheep on 'em, you guys. And this pair has a funky kaleidoscope pattern! Okay, you don't have to wear these the whole day, but we do recommend getting a pair, so commuting to work during the rainy season doesn't have to be a hassle. You can always opt to change into your heels or flats once you get to the office. That way, your feet can stay warm and dry, and your work shoes don't have to be totally ruined. Smart, eh? Plueys rainboots are available at www.readyforrain.com, and retail for about P1,200-P2,550. 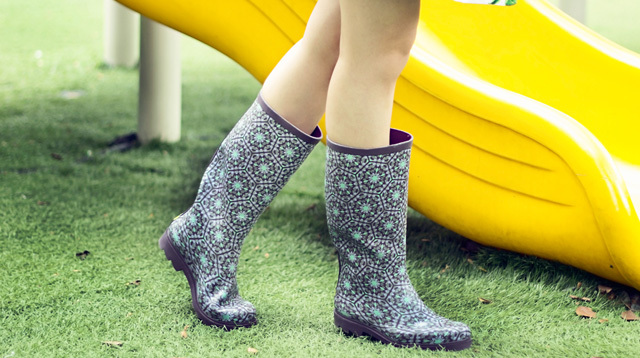 Get 20% off on rain boots at www.readyforrain.com from today until December 15, 2014. Use the promo code: ReadyForRain.